A few months before I got the Running Springs Jaco in my system, I was also on the lookout for a power cord I could live with, but I had the same dilemma. So much of what I had listened to in the past was more of a tone control, and that’s too much work for me to keep track of, with so much different hardware moving in and out of the studio. For many of you, if your system is just a smidge one way or the other, a specific power cord or interconnect may be that last little tweak that makes your system perfect. (At least for now…) But I was on a quest for neutrality. The presentation is outstanding as well. 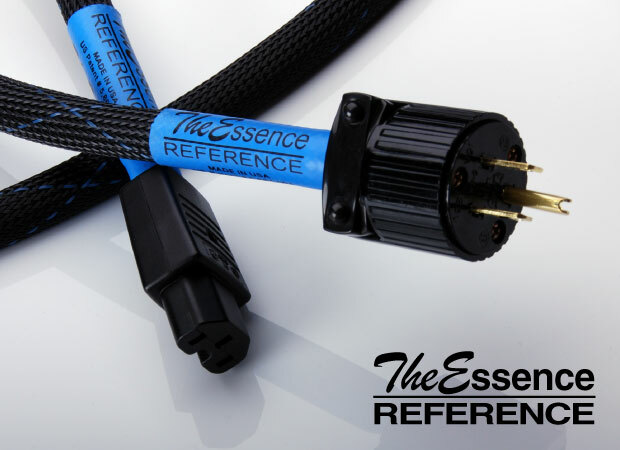 My reference system stays pretty much intact, but in the course of reviewing I wanted something that was a significant upgrade to the stock power cords shipped with everything, yet was ideally neutral. After a lot of evaluation, I still hadn’t found “the cord.” Granted, there are a few power cords in the $2-5000 each category that I did not get the chance to audition, but even at the good guy reviewer discount; I couldn’t afford six of those for my reference system. Another good friend in the industry who knew I was looking for power cords called and told me about the ESP Reference power cord. This particular friend is much fussier about sound than even I am, so I knew we were on to something. Michael Griffin, the man behind Essential Sound Products was extremely helpful on the phone and asked me more questions than I asked him. He explained that some of his inspirations came from his work as a product design engineer the auto industry, as well as being a lifelong audiophile. With outstanding results, I might add! A few of my friends are scientists and they pound me all the time to get quantifiable, repeatable results. This was very easy with the Reference cable. Where I did cheat at first was plugging all six of them into my system to get a composite view. Would this box of cables that are worth more than a nice used Ducati motorcycle make much overall difference in how my system would sound, and what would that be? Happily, the difference was not subtle. No tone control effect here, it was more like I peeled a blanket off the system. Highs were neither exaggerated nor rolled off and bass was more defined as well. My initial impression was that of moving up about 5 rows in the hall with no change in tonality at all. Once the cords had some time on them, I felt as if I gained a couple more rows. Backgrounds also became more silent which was a bonus. Overall, everything felt much more musical and correct, with a much bigger sound than I had before installing the Reference power cords. To make sure that my brain wasn’t making all this up, after about two weeks with the cords, I went back to all stock cords to double check and the sound collapsed dramatically. My peripherals list would take up two pages, so I’ll just give you the short version. I probably tried about 40 different components with these cords and then did it one at a time, to see if they had more effect on one type of component over the other. If you had to buy only one, start with your preamp or phono stage. Then work your way backwards in the system, but it’s still a pretty close call. With all of my components, this was where I heard the most improvement and every piece of gear that had an outboard power supply responded quite well, with the least improvement on CD transports. Just as with the RSA power conditioner, the benefit of improving power delivery was more noticeable on my system with the WAVAC amplifier and 2nd Rethm speakers, because of the noise issues being magnified here. My pal skeptical Roy had been by listening the evening before the cords arrived and we stayed up fairly late spinning records. The next day he came over and said, “wow, your system sounds a lot better, what did you do?” When I pointed behind the rack to all of the new power cords, he told me I was crazy. (That’s why he’s Skeptical Roy, after all.) I parted with one of them, knowing I was going to be at the RMAF for a few days and told him to live it up. Rather than go into molecular detail here, a quick peek at the Essential Sound Products website at www.essentialsound.com will reveal a pretty thorough explanation of the construction process. The cables are terminated and then the plugs completely sealed before the whole cable assembly is cryogenically treated. The presentation is outstanding as well. The finished cords are bagged in plastic, with red rubber covers on the plugs and then the whole thing is put in a grey zippered bag with the Essential Sound Products logo on the outside. Personally, I don’t care if they dunk these things in the French fryer at McDonalds to make them do what they do. I want neutral sound for my reference gear and that’s what the Reference cords deliver. If you want something to fine-tune your system a bit, this is not the cable for you. However, if you really want to get more music from your system, without affecting the tonal balance at all, I can’t recommend the Reference high enough. I’ll be using them in my reference system from now on! to make them do what they do. Reprinted by permission. Originally appeared in the December 2005 issue of "Tone Audio".